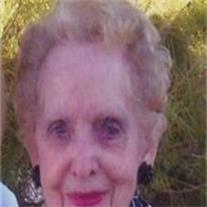 Ellen Catherine Binder, 88 passed away peacefully on August 9, 2012 in Mesa, Arizona. She was born to John and Bessie Beals in Ottawa County, Kansas in 1924. Ellen led a very happy, active life filled with family, friends, and many activities such as painting, sewing for her family, her church and ballroom dancing. In 1944, she married her neighbor boy, Leslie J. Binder and they were lucky to have celebrated over 50 years together working their farms in Iowa and raising their three daughters; Mary C. Peterson (Gary), of Trenton, MO. ; Patricia E. Sunde (Jim) of Cherokee, Iowa; and Joni L. Hodapp (Roger) of Osage Beach, MO. Ellen was preceded in death by her husband, Leslie, a granddaughter, Sarah Peterson, a son-in-law, Gary Peterson, her parents John and Bessie Beals, her brother Wayne Beals (Alluwee)and all three sisters, Wilma Trott (David), Dorothy Gray (Roland), and Doris Holman (Ted) and all of their respective spouses. Ellen loved her three daughters and her six grandchildren; Julile Klages (Jim), David Peterson (Stacey), Cory Hodapp (Sarah), Garrett Peterson, Katy Travis (Brooks), and Jillian Brown (Chad) and her twelve great-grandchildren: Katie and Braley Peterson, James and Jeric Klages, Sailor Van Loo, Rocco and Vince Hodapp, and Teague and Brett Travis, and Calvin, Amelia and Hayden Brown. Memorial Services are pending at the Warner Funeral Home in Spencer, Iowa.